In a previous post I talked about the issues with stat boost probability and offered solution in v2.0. However, I also mentioned that I didn’t quite see that as the final solution. Ultima 2 has been notably unique among its brethren in that how your character advances is completely random. By contrast, nearly all other Ultima’s offer the player a choice, whether via signposts, shrines, orbs or trainers. And while randomness does play some role in U4 & U5, it’s by no means the only means of progression. Ultimately, I feel that the player should get to choose. That should remove the impetus to restore and count your steps every time you don’t get the desired stat. Now we get technical. The original stat boost code has been completely refactored. Here test the config value to see if the gameplay fix is enabled. 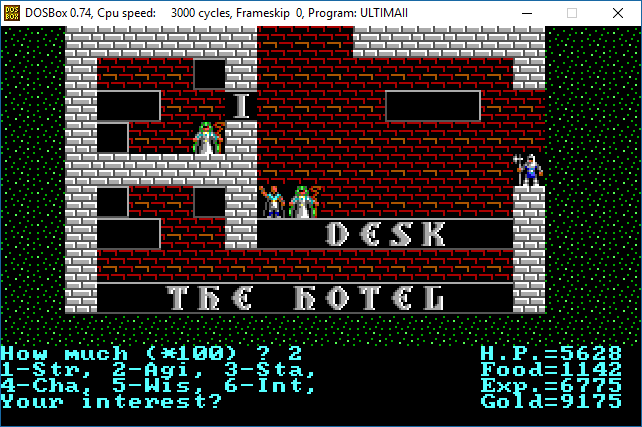 Offset 0x08fa contains the “gameplay fixes” byte and bit 0 represents the hotel clerk fix. There’s of course room here to store 7 other gameplay fixes, but they’re not in use at the moment. If enabled, we call out to prompt the user to select a stat. If not, we call another function that contains the original logic that randomly chooses a stat with a 75% success rate. Note that there’s no “if/else” in assembly language so we have to construct the equivalent with jump instructions. Next, we check if the returned value is in the range 0-5 which indicates a valid stat id. The value may be outside that range if the player chooses an option other than 1-6. Or, if the fix was disabled, we likely have hit that 25% failure rate for a random stat. Lastly, we fetch the stat value from memory and call a function that increments the stat. Incrementing a stat is a bit more complicated than just adding the offer amount, as we also have to do an overflow check & cap if a stat rolls beyond 99. We repeat 4 times to achieve the 100 gold to 4 stat points ratio.